Re-blogged from here: The Irish Catholic, 2013. 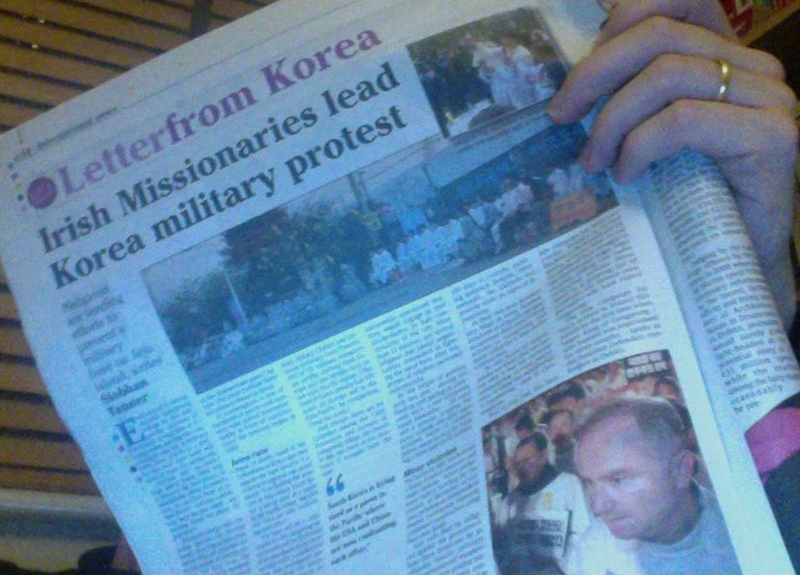 Irish Missionaries lead Korea military protest (Fwd by John Whipple). 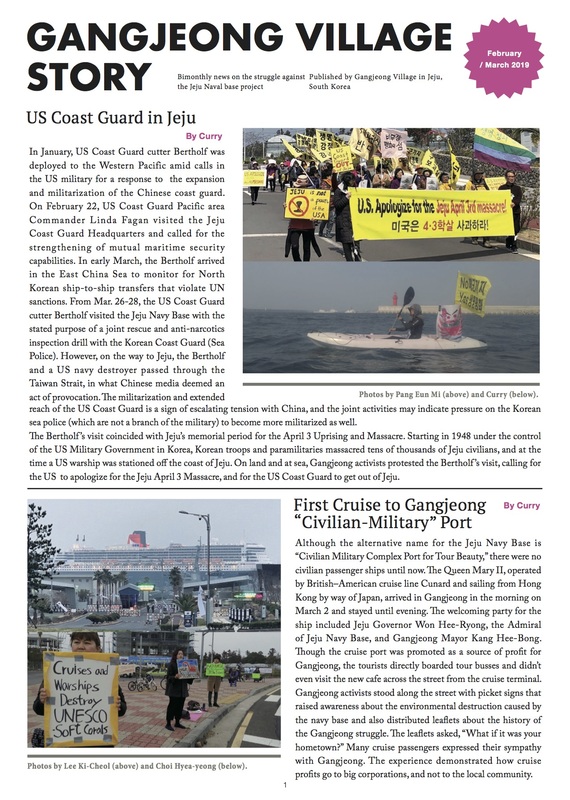 Though it does not necessarily reflect Save Jeju Now’s own view, the re-blogged article is helpful to glance on the degree of international solidarity opposing the Jeju naval base project. The role of Catholics worldwide, especially Irish Catholic’s, represented by Fr. Pat Cunningham, is remarkable. Religious who gathered for the anniversary Mass on Jeju. Every day at 11 o’clock outside Gangjeong village on the spectacular coastline of Jeju island, a long line of cement trucks, serving the construction site for a military naval base, grinds to a halt. For the next hour none will enter or leave the compound. Outside the six-metre high metal fence, their way is blocked by two priests in windblown white vestments. One, on rotation from an island parish – and one, a Jesuit, sent here for this cause – are holding Mass for about 20 protesters. When the liturgy ends, the group spreads out, holding hands. They sing protest songs before they are drowned out by the sound of starting engines. The hour is up. The trucks, flanked by hundreds of police, army and private security (up to 600-strong, reports one observer) break forcibly and easily through the human chain, arresting some and scattering others. This is the daily show witnessed by Colomban missionary, Fr Pat Cunningham, who has become increasingly radical since coming to South Korea in 1992. He has been threatened with deportation for protesting a massive military naval base on the pristine Unesco-protected island of Jeju, 50 kilometres south of the Korean peninsula. More than 130,000 police and army personnel have been sent to supress the opposition since 2011. “Surveillance is so huge down there and anyone who criticises the base is ‘red-brushed’ and labelled a North-Korean sympathiser in the mainstream press,” he tells The Irish Catholic from his mission house in Seoul. Fr Cunningham is one of hundreds of priests and nuns who have placed themselves bodily in front of machines since the protests began in 2007. The base will be a catastrophe for the Gangjeong environment and the livelihoods of the population living there; warship traffic is predicted to drive nine endangered species, including the bottle-nosed dolphin, towards extinction. Due to be finished by primary contractors Samsung in 2014, the base will be contracted by the US to house 7,000 marines and 20 warships, including aircraft carriers, nuclear submarines and destroyers armed with ballistic missiles which will patrol the East China Sea. And though there are no Catholics among the 1,500 fishermen and farmers of Gangjeong village, the Church in Jeju has been at the forefront of struggle from the start. When the governor of Jeju (since ousted) agreed to accept the naval base on the island province in 2007, local priests went on a hunger strike and their bishop, Peter Kang U-il, wrote an open letter to South Korea’s president urging a referendum on the plan. The Jesuits too waded into the battle early, sending priests from the mainland – four of whom were imprisoned for sentences ranging from one month to three. Then, two years ago, the Church in Korea made a bold political move when clergy nationwide announced that they would engage in civil disobedience to halt construction of the site. More than 15 dioceses and several religious and justice organisations committed to fighting the naval base. After this, arrests of religious increased exponentially. At the height of activity early last year – during the blasting and paving of Gureombi Rock, a one-kilometre basalt formation – 20 nuns and a priests, praying for peace outside the gate were arrested, while 13 Catholic priests went on trial for holding a Mass and sit-in protest. The battle for Jeju has become a litany of minor victories and major defeats. When parliament halted funding for the project, in December of last year, pending an independent review, contractors Samsung continued construction using their own funds. Law suits filed by villagers against the government have been dismissed by an allegedly hostile judiciary and environmental monitors report that once-pristine water sources have been contaminated while dredging has started to kill the underwater coral. Meanwhile, the penal crackdown on activists has increased. Three months ago, Brother Park Do-Hyun and Dr Sang Kang-Ho, members of Save Our Seas, were arrested while monitoring the dredging of the sea-bed which was being done without environmental protection measures. Both men have passed 100 days in custody, awaiting sentence. Despite, these setbacks, the Catholic-led protests show no signs of diminishing. At their two-year anniversary Mass in early October, hundreds of religious pledged to continue their non-violent actions in Gangjeong and again called for a stop to the construction. “In our heart of hearts, maybe we know that we cannot stop it but we continue campaigning to raise awareness, to show the world what is happening,” says Fr Cunningham. And to this end, the Save Jeju campaign has been successful. Despite a virtual blackout in the Korean and US media, activists have raised the profile of their struggle to the international stage, most recently adding the name Hollywood director Oliver Stone to a growing list of celebrities and famous commentators who have visited Gangjeong. The Jeju campaign for Peace arrived in Ireland this month for the first time when Mayor Kang of Gangjeong – who himself was imprisoned for three months – spoke at the Frontline Defenders conference in Dublin.